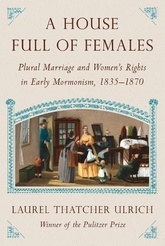 Our fascination with early Mormon society has focused largely on its founding prophets. Pulitzer Prize-winner Laurel Thatcher Ulrich offers a welcome corrective as she portrays the women of "plural marriage," whose seemingly ordinary lives belied a revolutionary spirit, drive, and determination. Through a cache of nineteenth-century diaries and letters, Ulrich reveals how these women became powerful political actors in spite of-or because of-their marital arrangements. So deep was their influence that their right to vote in Utah was granted by a Mormon-dominated legislature in 1870 as an outgrowth of polygamy-fifty years ahead of the vote nationally ratified by Congress. Here is a refreshing new angle on a culture long shrouded in mystery. Laurel Thatcher Ulrich is 300th Anniversary University Professor at Harvard University, and a former president of both the American Historical Association and the Mormon History Association. As a MacArthur Fellow, Ulrich worked on the PBS documentary based on her Pulitzer Prize-winning book A Midwife's Tale.